Removals To Spain Part Loads - What Is A Part Load And Can It Save You Money? Part loads removals to Spain could be exactly what you need if your move abroad is under a tight budget. Moving can be costly, but using part loads can help to reduce those cost. A part load move to Spain is perfect those with a tight budget but some flexibility in schedule. 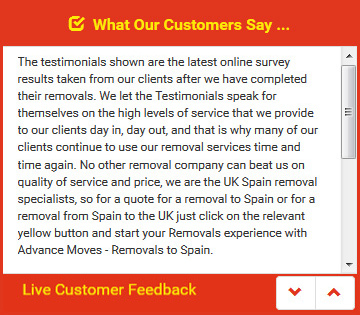 Dedicated removals to Spain are usually booked for a specific date by the customer, which can cost a lot as it must include the distance, time and salary involved. A part load, however, is booked by the company and will consist of a few peoples� items. This means sharing the lorry space and only paying a fraction of the cost of having to hire one each. Many removals companies are happy to offer discounts, and can make drop-offs at a number of locations. It also means that fewer lorries need to be used at any given time. Advance Moves specialise in removals to Spain, and are happy to take on your part loads. Fill in the Quick Quote form and give us a call to discuss part load deals and potential dates for your move.